A year ago on Memorial Day I posted this post: http://crzblue.mlblogs.com/2010/05/31/memorial-day-in-flanders-fields-we-shall-keep-the-faith/. It contains the two poems “In Flanders Field” by Lieutenant-Colonel John Mc Crae and “We Shall Keep the Faith” from Mona Michael. They are two powerful poems. Roy Gleason at Dodger Stadium during a Camera Day. Great posts Emma. Thank you for always keeping us mindful of our veterans and those who never made it home. In Flanders Field is always so powerful and I had never read We Shall Keep the Faith before, also very powerful. I thought the same thing as Phillie, thats a lot of players from one team. Makes me wonder about Cubs in the military. I counted 43 Dodger Veterans there! 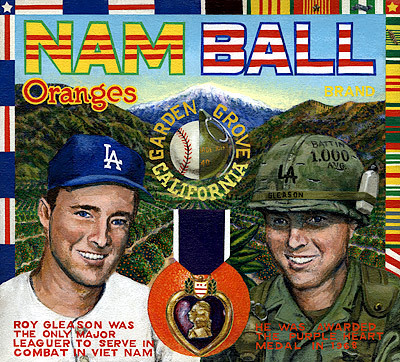 Just go to http://www.baseballinwartime.com/those_who_served/those_who_served_nl.htm and click on National League. I counted 29 Cubs that went to WW11 and 51 Phillies. Wow! One cool thing that strikes me about baseball back in the ’40s was how players put their country ahead of their careers and went to serve. I get that society in general has changed since then, but I also think that $10 million contracts have something to do with it. Catherine, I read that during WW1 you could go to war or work in a company that made war related items so that was a way some for baseball players fulfil the requirement. Did not see the marriage proposal. Haha. Hey! yes, I am going to Target Field. My friend Lorena and I will be there for the three game series! Can’t wait!